I'm always glad when you stop in to visit! I have this collection of projects from the last year or so that I have never posted about. So I thought I would spend the rest of October trying to get them written up and posted. There are a few reasons I've been sitting on them. Some of them have bad pictures . . . Some don't have very many pictures at all . . . Some should be tutorials, but I don't have tutorial pictures . . . I guess maybe those are just excuses to read facebook and pinterest instead of making a post. 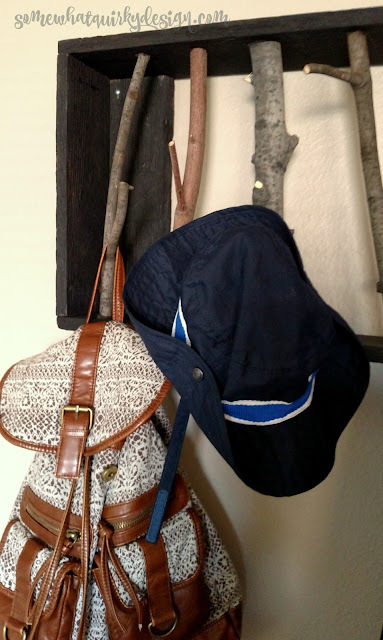 Since it's fall, let's start with this little ol' coat rack I made for my daughter's home last Christmas. I saw one like this a few years ago on Pinterest. I could have sworn I knew the original source for this but I ended up chasing a rabbit on that. The way I made it was to grab some petrified pallet wood. Yes petrified. It sat out in the fields at Silo Hill Farm for a long time. Danni gave it to me and I brought it home and of course, went straight into the garage. Affiliate links are included here for your convenience. Grab three boards that are at least 4 inches wide. Cut two of them to identical lengths and one of them in half. The identical boards are your top and bottom. The short ones will be the sides. I cut mine with a Miter Saw but they can certainly be cut with any saw. Connect the sides in between the top and bottom lengths with screws, nails, or long staples. Here is where I have to say that petrified wood is really hard. Hard like a rock. That makes it difficult to nail or screw. Even my Air Strike Nailer had a really hard time. I had to pre-drill every hole - whether it was for a nail or screw. Once I realized I had to pre-drill, I just used screws for everything. Gather several large branches that have good sized branches on them. A good time to do this is in the spring or fall when tree pruning is going on in your neighborhood. Another good time is after a storm and the clean up piles are on the side of the road. I encourage you NOT to wait until a rainy day in December when the pickin's are mighty slim to collect your branches. That may or may not have been what I did. It just isn't a good idea. Cut the branches to just an inch or so longer than the interior height of the wooden box you just made. 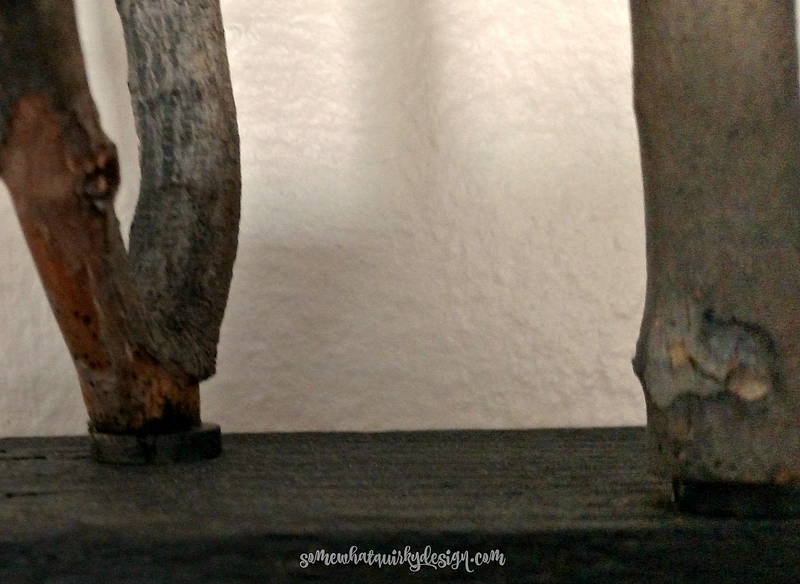 I used a miter saw for this, which makes it oh so easy. If you don't have a chop saw you can certainly use a regular saw. But it is not as easy that way! Fit the branches in between the top and bottom of the outer box. You want the branches to fit at the angle that best presents the "hook" that is created by the branch on the branch, if you get my drift. Trim the branches to fit the space from top to bottom. Some just need the angle adjusted a little bit. Mark the position of each branch. When you have all the positions marked then start pre-drilling the holes you will need to screw the tops of the branches to the top of the box. Place 1 1/2" wood screws into the holes. If you aren't using petrified wood you will be able to counter-sink your screw without using a counter-sink drill bit. If not, you will need to drill with a counter-sink drill bit. You want to top of the screw to be flush with the top of the wood. Turn the box over and connect the bottom of the branches to the bottom of the box - just as you did the top. If you are not so good at the marking and cutting like me, slip in a disk of branch like I did to fill the empty space. Cut two narrow pieces of wood the same length as the side pieces and attach them at the left and right edges of the box, between the top and bottom. Drill a hole in the middle of the wood 2" down from top and 2" up from the bottom. Stain the outer box with the liquid stain of your choice. I used Minwax Onyx Stain. Then I "painted" the screws with a black marker to cover the shine. Screw into the wall through the holes in the wood you attached at the back corners. Adjust rack so that at least one end is screwed into wall studs. Use appropriate wall mounts for the other end. One more note: when you wait until a rainy December day to collect the branches, you may have a problem finding the best branches for the job. When you look for your branches, try to find ones with a bit larger branch limbs on it. The ones I ended up with are not the optimal size. They will probably hold up, but the bigger they are the more weight they can support. I love this thing. I need to find a space to put one in my own house. If I do, I can guarantee I will NOT used petrified wood. I'm going to save HOURS by making it out of soft pine! So take the hint and make yours from softer wood. 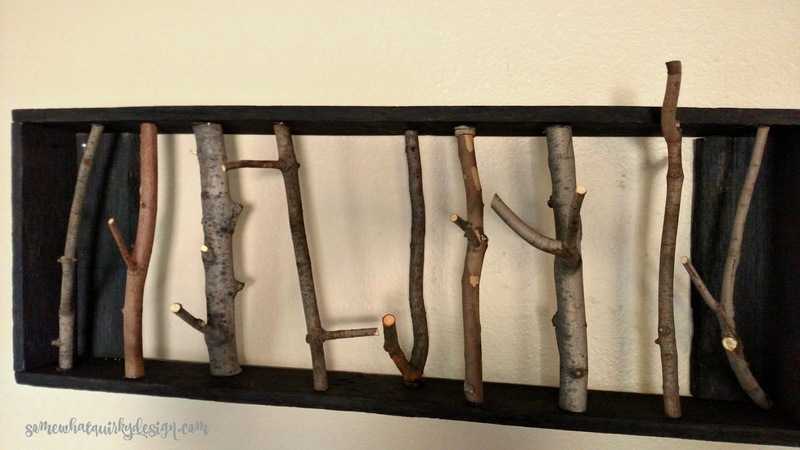 I love your coat rack, Karen! It's really somewhat quirky, isn't it? And the fact that it's made of petrified wood from a pallet that Danni gave you - well, I hope you are still in touch with her and send pictures. She's no longer at Silo Hill Farms and I hope she's doing great! Thanks for the awesome tutorial and reminding me of a wonderful lady. Tell her I miss her here in blogland! 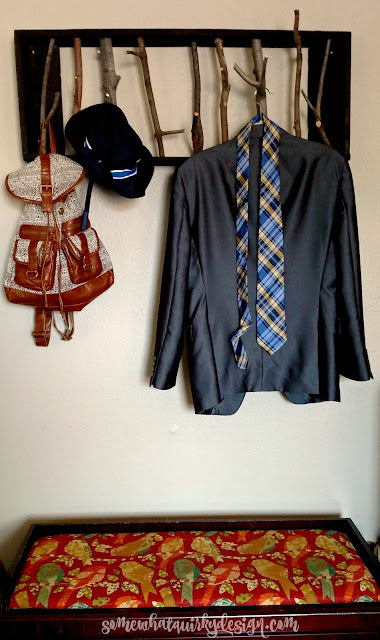 That coat rack is so cute! So creative and fun Karen. Love this. What a great looking coat rack, would be perfect for a cabin too. Pretty ingenious thinking figuring out how to put it together. 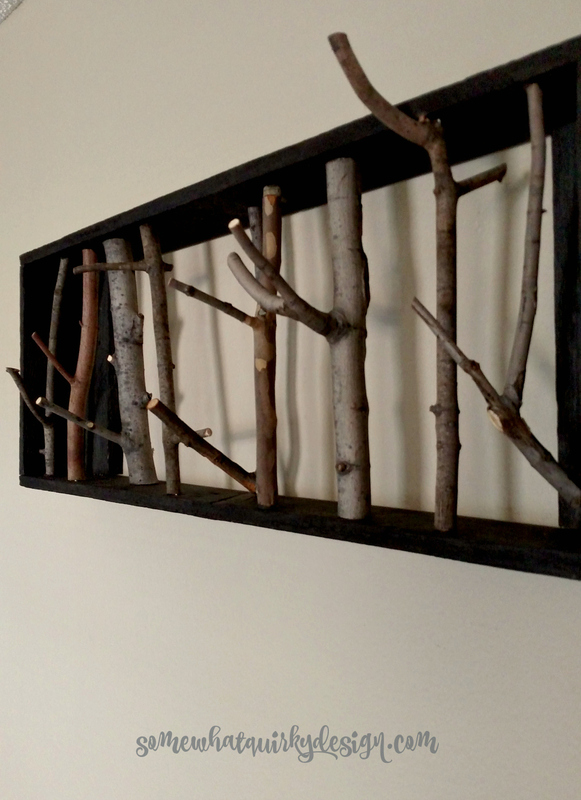 I was thinking could maybe use a long wide enuf picture frame if could get branches in it to stay. Am always amazed at how talented bloggers are and what you can come up with, awesome. That is awesome, lucky daughter!